In a frying pan or pot, melt the butter and sautÃ© the onion and flavour pepper until they become limp. Add the ground beef, salt, pepper, curry powder and thyme and mix well. Cook until the meat is evenly brown on medium heat. Add the breadcrumbs and stocks and combine all the ingredients well. Cover and simmer for about 10 to 15 minutes, stirring occasionally. When all the liquids have been absorbed, the filling is ready. It should be moist, but not watery. Let the meat cool while you prepare the dough for the crust. Pre-heat oven to 400. Sift all ingredients into a large mixing bowl. Cut in the shortening until little pea-shaped clumps form. Refrigerate the flour and shortening mixture for 30 minutes before adding liquids. Add the egg and water mixture and mix until a sticky solid ball forms, (add a little more flour if needed). Do not knead. Wrap tightly in plastic wrap and refrigerate for 1-2 hours or overnight. Let the dough sit outside of fridge for 20 minutes before rolling out into a 1/4 inch thick sheet. Then fold the dough into five layers. First fold the left side over half way to the middle of the sheet, then do the same thing with the right side. Then fold it in half again. This is how you get those flaky layers in the crust. Roll the dough out again from the centre into a 1/8 inch thick sheet and cut out desired size. Fill your dough with filling on half of each. Donât overfill. 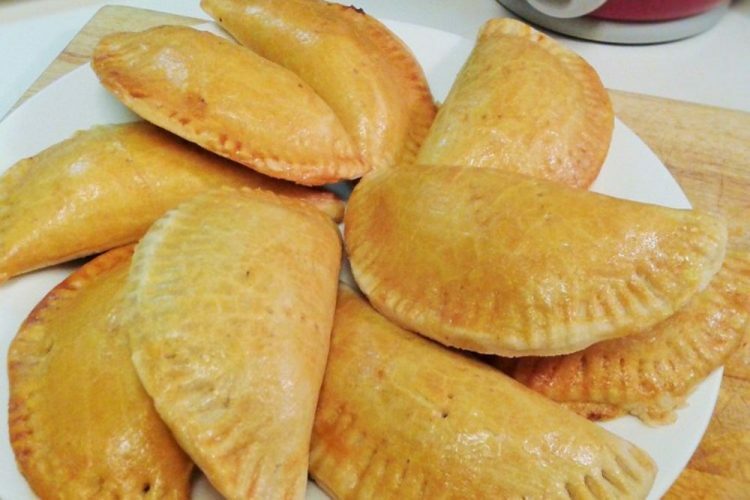 Moisten the edges of the dough with water and fold the dough over the meat filling. Pinch the edges closed with a fork. Brush pastry with egg batter. Bake on a lightly greased baking sheet for 15 to 20 minutes, or until the pastry is golden brown. A little meat might come out of the crust; that usually indicates when it is done or very close. Tips: Feel free to add any seasonings of your preference to the meat.